I know y’all lead busy lives, so I wanted to share with you my favourite 5 minute meal I have been making lately (like kinda a lot). To be honest, I tend to eat pretty simply at home. I work most evenings with my healthy coaching groups or teaching yoga and don’t have time to make an elaborate meal, so this 5 minute meal works well for me. It’s nutritious, delicious, quick, easy and inexpensive to make. What more do you need?! I would honestly eat this meal for breakfast, lunch or dinner, but you might want to start with lunch or dinner first. When you’re using fresh ingredients, you can keep food simple and let the flavours shine, making a really delicious meal without much effort. Garlicky Kale: Fav 5 Min Meal. 1 bag or bunch of kale, about 5-6 cups worth, washed and chopped to bite size pieces. I leave the stems on. *optional 2 organic, free range eggs. If you're feeling hungry, add a poached or fried egg on top of each dish. Heat the coconut oil in a large frying pan. Once coconut oil is melted, add the kale and garlic. Add chili flakes if using. Toss kale in coconut oil to coat well. Sprinkle pan of kale with sea salt. Cook for 2 minutes. Meanwhile, start cooking your eggs, if using. Add 3 tablespoons of water to the pan of kale and cover with a lid to steam and soften the kale for another 3 minutes or until stems have softened. Meanwhile, cut up your avocado and set aside. Remove lid and cook kale for another minute or two until all the water in the pan is gone. 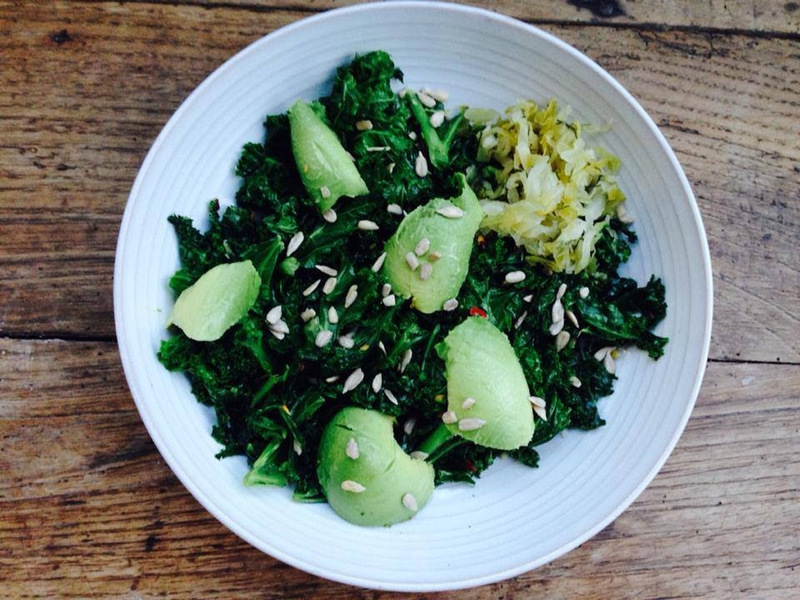 Separate kale into two separate bowls or plates, top with avocado, seeds and an egg if using. I like a side of homemade sauerkraut with mine as well!